Former President Mahinda Rajapaksa is ignoring the 19th Constitutional Amendment. 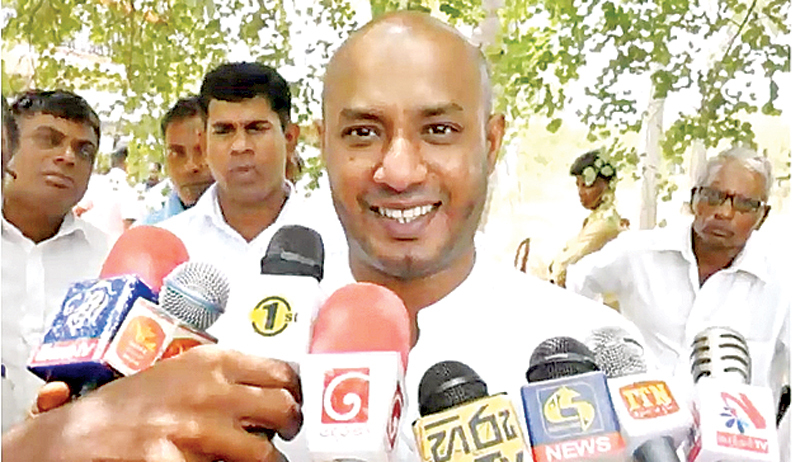 This Amendment allows a person to hold the Executive Presidency for two terms only and no more, said SLFP National Organizer and Irrigation, Water Resources and Disaster Management Minister Duminda Dissanayake. The minister was addressing the media following a ceremony at his Anuradhapura office, recently. Minister Dissanayake said it was evident that the former President was hoodwinking the masses saying that he had the right to contest the forthcoming Presidential election, only to cover up the political reality and discrepancies in the Opposition as there was no suitable or acceptable contestant to compete at the elections. “His other objective is to divert the attention of the people to hide the chaotic situation within his group,” he said. “Neither I nor former President Chandrika Bandaranaike Kumaratunga is thinking of a political tying up of the UNP and SLFP. We shall never allow the SLFP to come under the command of Mahinda Rajapaksa again,” he added. “It is natural when two major political parties enter into an alliance that numerous problems arise. It does not mean that we cease our mutual agreement and break away. We, the national government, are stable and determined to move forward together strongly and energetically,” the SLFP National Organizer added. He said the law of the country was equal to all. Earlier, there was a barrier to inquire into the decisions taken by an Executive President. “There should be a law where even the Executive President is not permitted to surpass the law of the country,” the minister said.